In preparation for Constitution Day 2016, several members of the Scholastic Press Rights Committee (SPRC), a committee of the Journalism Education Association, created lesson plans specific for the event. We suggest celebrating Sept. 16 since the official Constitution Day is Saturday this year. We created these lessons to help celebrate the Constitution and Bill of Rights, as mandated by Congress. Legislation requires schools to offer lessons on the Constitution and how it affects all Americans. Our lesson plans emphasize the First Amendment and particularly the freedoms of speech and the press. Keep reading. There are more special offers at the end of the CD Day materials. Please contact me if you have any questions or feedback about the lessons or how to implement them. The SPRC works to provide information and resources on legal and ethical issues to journalism students, teachers and administrators. SPRC members also work to promote the First Amendment rights of students across the nation. To see past years’ lessons, go here. Also has links to previous years. Please send any feedback to keekley@gmail.com. I’d love to hear from you! Additionally, we are reintroducing the Making a Difference Campaign. This campaign will highlight at least one piece of student work each month to help illustrate how students can make a difference through their coverage. The first Making a Difference in 1988 showed how students reported the impact of the Hazelwood decision. These are examples of student media that had an impact on the community or school where they were produced. They can be print, digital, video or audio. On Constitution Day, we’ll release the link to the submission form and explain the process. SPRC members will select student work that made a difference, post it on 45words.org and promote it on Facebook, Twitter and other social media. Let others see the work you have created. When you have something to contribute, please send it to us! Importance of state legislation: Although many educators and advocates think of the First Amendment (and the court decisions interpreting it) as the most important tool for interpreting student press rights, there is another equally important source of law: state statutes. Talking Points: With legislation giving students decision-making power over their student media comes questions about roles, purpose and standards. If the school cannot make content decisions who is responsible? What is the role of the adviser? Of students? If the adviser cannot control content, what guidelines will students follow and why? Tips for engaging communities: With new legislation, or attempts to pass it, comes the need for ways to engage those who would support it. The ways can run from concept to concrete and can be delivered in many approaches with details determined locally. Legislation terminology: A compilation of important terminology so everyone can better understand the language and issues surrounding student free expression language. What to do if school officials threaten censorship: Even though state legislation can provide protection, sometimes others do not understand that and need further education. Use a friendly and informative approach and help them understand. Here are some steps we recommend. Sample press release on state legislation: Another option for letting your various communities know about the benefits of free expression legislation is to create a press release to media, civic groups, school board and others. • An important part of JEA’s supports for free expression rights for student journalists is the First Amendment Press Freedom Award. 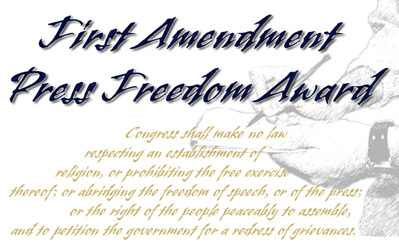 In its 17th year, the award recognizes high schools that actively support, teach and protect First Amendment rights and responsibilities of students and teachers. The recognition focuses on student-run media where students make all final decisions of content without prior review. The award comes in two steps, with Round 1 due before Dec. 1. The entry form and entry information can be obtained here.